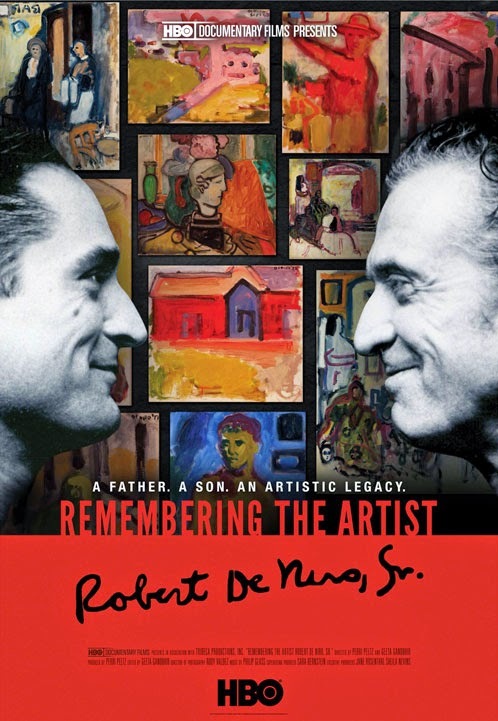 Remembering the Artist: Robert De Niro, Sr. premiers Monday June 9, 2014 at 9PM on HBO. This 40-minute feature from HBO Documentary Films shares an introduction to the art and career of Robert De Niro, Sr., and features many personal insights from the late artist’s son, the actor Robert De Niro. De Niro, Sr. was a prominent painter in New York City in his early adult years, but fell out of the spotlight as trends in art shifted away from his style. The artist seems to have struggled with depression due to difficulties in his life – his art career did not maintain the high level of esteem for which he hoped, and his marriage ended when he realized his own homosexual feelings. The artist separated from his wife when his son was two years old. Although the film is about the art of the senior De Niro, the participation of his son is particularly interesting. De Niro often helped his father throughout his father’s struggles (in one letter, his father calls him an “angel,”) but also expresses regret that he did not help his father even more. De Niro may be responding to his regrets by immersing himself in his father’s artwork. Remembering the Artist: Robert De Niro, Sr. is an interesting film for fans of the actor and for lovers of art. It also may connect with people who for one reason or another, have not had quite the relationship they had hoped for with their parents. It probably will connect with adults rather than kids. The film first runs June 9, 2014 at 9 PM on HBO. De Niro and each of his parents were very creative. What traits and talents run in your family? In the first family of the child you adopted? It’s possible that De Niro’s investment in his father’s artwork is fueled by sadness at the loss of his father. If this is the case, it seems like a healthy way to process grief. What losses do you mourn in your own life? What losses might your child be mourning? In what healthy, creative ways can you honor what was lost? Interested in more documentary reviews? Click here! Check out this list of adoption-related films now playing in theaters: Click here.